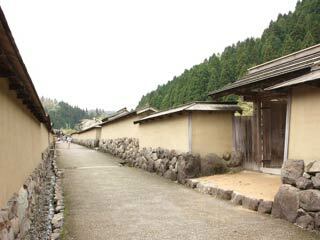 Ichijodani (一乗谷) is a historic site of castle town during the Sengoku period. It is located in Fukui pref. Ichijodani was the capital of the land of Echizen built and ruled by Asakura clan. Because Ichijodani had never been used for a city after the destruction in 1573, this ruins of a mega city had been preserved for over 400 years. There are restored Samurai residence, beautiful traditional gardens and ruins of the house of feudal lord of Echizen. This historic site of Ichijodani presents the real life of Sengoku period since most others remained today are strongly influenced by Edo government. Admission to the restored residence: 210 yen. There are group discount from 20. Closed on: New Years Days. Ichijodani is designated as national historic site and special national landscape. Also, the relics found in this place are registered as the important national properties. Ichijodani is the only site which designated three important categories at once. The ruins of the city is located around Ichijodani river. It is about 1.7km long and 500m wide. This city is surrounded by mountains which makes this as natural fortress, and on the top of mountain, there is a castle. There are gates at the both end of the valley, and inside of the gates was the castle town. During the 16th century, it was the 3rd biggest city in Japan. There are over 10,000 people lived. The city was well built and designed Asakura Takakage, the 7th lord of Asakura clan. Also, because of the confusion of Onin War happened in the middle of 15th century, many high priests, nobles, litterateur and scholars are moved to Ichijodani. They brought the technology and culture of Kyoto which helped the florescence of Ichijodani. Ichijodani was called "Little Kyoto." At the end of Sengoku period in 16th century, Asakura Yoshikage, the last lord of Asakura clan, was overthrown by Oda Nobunaga, and Ichijodani was burned down into a ground. After the destruction, the place of Ichijodani was never used for a city. Therefore, all the important ruins which proof the life and structure of Ichijodani remain in great condition. The research and restoration have been carried out for over 45 years now, and they still find the new evidence of Sengoku era. Ichijodani was resting for over 400 years without any change, and today, the city of Sengoku is restored. After the historical research, Ichijodani restored Samurai Residence. Those houses and buildings of the residence stand on the exact same location in the exact same way with the exact same materials. This residence offers the time traveling to the Sengoku Period. There are 4 gardens in Ichijodani. They are designated as the special national landscape. The oldest garden in Ichijodani. There is no record about the use of this garden. This garden is so old and traditional so that it has own history. Some of Japanese artist visited this garden and they spend a day just watching this garden. This garden was probably built at the last. It is very small but has a stone floor at a pond. This is the garden where Asakura Yoshikage had a welcome party for 15th Muromachi Shogun, Ashikaga Yoshikage. It is the largest garden in Ichijodani. It was built by Yoshikage for his wife, Koshosho. There are over 100 stones, a large pond and waterfalls. The huge stone placed in the middle of this garden is the memorial monument of Asakura former lords, Sadakage, Takakage and the general Soteki. ... is the 11th and last lord of Asakura clan. He was born in 1533, and became the lord in 1548. Because he was still young, Asakura Soteki, the general of Asakura army, supported him for both military and government. Soteki was the son of Takakage, the 7th lord of Asakura, and he served for 3 generation of the lord of Asakura. He was a great general. Legend said, he defeated the 300,000 soldiers of the riot of Ikko Buddhism with only 11,000 of soldiers. In 1552, the 13th Muromachi Shogun, Ashikaga Yoshiteru gave his name "Yoshi" to him and he changed his name from Norikage, the former name, to Yoshikage. However, Soteki died in 1555, and after his death, Yoshikage worked for both military and government. In 1565, Ashikaga Yoshiteru was killed by Matsunaga Hisahide. Yoshiteru's brother Yoshiaki, he became the last Muromachi Shogun later, escaped to Ichijodani. Yoshikage supported Yoshiaki's life, but never support him to became Shogun. Soon, Yoshiake moved to Gifu to get support of Oda Nobunaga. In 1567, one of his servants, Horie Kagetada betrayed him and brought the riot army of Ikko Buddhism of Kaga land. However, Yoshikage defeated them and conquered Kaga Land. In 1568, Yoshikage also captured the lord of Wakasa Takeda clan at ichijodani to put Wakasa under his control. He conquered most of Hokuriku region by this time. However, after he extended his land greatly, he committed his cousins, Kageakira and Kagetake, to take care of the government. Yoshikage started spending most of his time playing with his wife. In 1568, Ashikaga Yoshiaki became the 15th Shogun by the power of Oda Nobunaga. However, Yoshiaki couldn't get together with Nobunaga long. He asked Yoshikage to rise his army and defeat Nobunaga. Nobunaga also asked Yoshikage to visit Kyoto and show the acknowledge fealty to Nobunaga. However, Yoshikage never answered both offers. In 1570, Nobunaga and Tokugawa Ieyasu raised their armies and invaded the land of Echizen. Asakura's brunch castles were fallen, and Ichijodani was in danger, but suddenly Azai Nagamasa, Nobunaga's brother in law, betrayed Nobunaga, and attacked the line of supplies. Nobunaga and Ieyasu was in danger at the moment, but they survived. As soon as they got back to their city, Nobunaga and Ieyasu raised again to attack Azai. In june, the Union of Asakura and Azai fought the Union of Oda and Tokugawa at Anegawa River. Asakura and Azai was taking advantage in early period of the battle, but Tokugawa Ieyasu defeated the general of Asakura, Takekage, and lead the Union of Oda and Tokugawa victory. In September, when Nobunaga moved his army to Settsu and emptied Omi area, Yoshikage attacked Omi-Sakamoto. He killed several Samurai of Nobunaga, and settled his headquarter at Enryakuji Temple. Nobunaga forced the imperial court to bring about peace between Nobunaga and Asakura. In 1571, Yoshikage accepted his offer and let his daughter married the son of Honganji priest, Kennyo. In July 1572, Nobunaga surrounded Odani Castle, the castle of Azai. Yoshikage send his rescue force to help Azai. They helped Azai, but also missed preventing Nobunaga to built fortresses between the land of Asakura and Azai. Because of those fortresses, the resistance of Asakra's army were seriously limited. Nobunaga also send many spies to let Yoshikage's samurai betray him. Many of his Samurai gave up the future of Asakura clan and betray to Nobunaga. In October, Takeda Shingen raised his army to Kyoto and attacked the land of Ieyasu and Nobunaga. The Shingen's plan was attacking Nobunaga from both east and west, because if Azai and Asakura raised their army to Nobunaga, Nobunaga was completely surrounded, and could had been defeated. However, because those fortresses of Nobunaga blocked the march of Asakura's army, and also they were blocked by heavy snow, Asakura had to pull back their army. The plan of Shingen was failed, and sent Yoshikage the letter of his anger. In 1573, Shingen died and the army of Takeda pulled back to Kai. Because the half of enemy was left, Nobunaga moved his army to Omi to attack Azai. In August, Nobunaga raised 30,000 of his army to attack Azai. Yoshikage ordered his samurai to help Azai. However, Asakura Kageakira, and Uozumi Kagekata denied Yoshikage because their army were not ready. Yoshikage brought 20,000 of his army and attack Nobunaga, but because Nobunaga broke the connection between Azai and Asakura, he lost the battle, and surrounded by Nobunaga. He lost many of his great samurai, including Saito Tatsuoki, the son of Dozan, and most of his soldiers. When he arrived at Ichijodani, he had only 10 samura around. When people and soldiers heard that ruinous lost of Asakura, they escaped from the city. Yoshikage abandoned Ichijodani and moved to Ono for the help of Kageakira. Ichijodani was burn by Shibata Katsuie. Kageakira offered Yoshikage to fight against Nobunaga with his army, but he already betrayed to Nobunaga and it was trick to move Yoshikage out from Ichijodani. Yoshikage was surrounded at Kenshoji Temple and committed Seppuku. "My 40 years of life was very stormy. It was not for others, but not for myself either. No matter what, everything goes back to the universe."